We are so happy to be featured on Convival’s Home, Table, Garden Interview series to showcase some of their incredible products in A Cozy Casa! See their original blog post here. Our new Home, Table, Garden Interview Series was initiated to feature Convivial wares within a wide range of settings, styles and uses. Our hope is that these journal entries will inspire you towards curating spaces and implementing practices that push you towards living a life of conviviality. We create the wares, you set the scene. 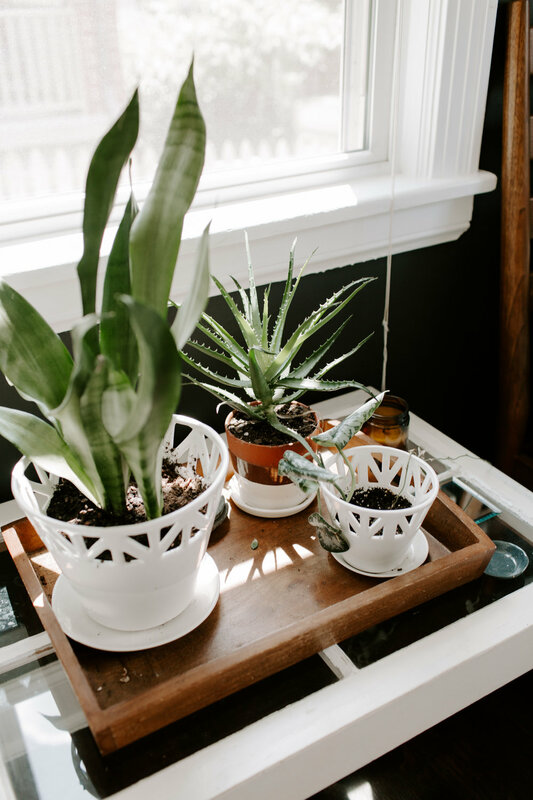 This post highlights Katie Lentile's use of Convivial products from the Home + Garden Categories to create an indoor garden work/live space within her Tennessee Airbnb & home! Hi! I’m Katie Lentile - the owner of A Cozy Casa (which is my house - ha!). I’ve lived in Nashville Tennessee for the past ten years and bought my house five years ago. So why does my house have it’s own brand? Great question! I started a digital marketing and creative agency a few years ago and our team works on a lot of social media accounts for clients. With our social media clients, we do everything from marketing strategy and engagement to photo shoots and overall aesthetics. Additionally, I travel a ton for work (and play) so I Airbnb my house when I’m out of town. Those two things combined, I decided to start an Instagram account for the house to use as a test for a lot of our strategic marketing approaches on social media and it has been a fun way to market the Airbnb. Also, most of my work days are spent overseeing my business, creating strategies and producing media so I rarely ever get to tap much into my creative side. Decorating + styling the house allows me to flex my creative muscle. Our Geodesic Fruit Bowls are handmade and individually carved. Your home functions as an Airb&b correct? Can you tell us a bit of this story...? Do you live in it when Airbnb guests check in? Or is it solely dedicated to being a rental? Yes, that’s correct! A few years ago I decided I wanted to do longer trips when I travelled because being able to work from anywhere is one of the greatest perks of owning my own business. Through various jobs in the past I’ve had the opportunity to travel all over the world and have loved meeting people and getting to learn about different cultures. I believe that one of the best ways to learn about a city is to live like a local. Airbnb provides as close of an opportunity to that without actually knowing a local before your trip. So I decided to open my home to those visiting Nashville and give them all the secret insider tips on what to do in Nashville. I don’t stay in my home with Airbnb guests unless I know them personally. I’m introverted and a lot of my life is spent living like an extrovert so I cherish the times I get to be at home by myself or with a few close friends. Your space seems to run the line of warm + welcoming yet professional + refined - a hard balance to achieve! Can you describe your space and general aesthetic? That is such a nice compliment and I always appreciate people that notice the balance of it all. As I mentioned earlier, I travelled a lot for work in the past — specifically to developing nations. I worked with various makers and met artisans all over the world and slowly brought home items that have such deep meaning to me. Additionally, I was surrounded by architecture and interior design my entire childhood. My dad is a civil engineer and I would go with him to job sites and learn about architecture and structural details…hence my obsession with symmetry and details. My grandparent’s had exquisite taste and really influenced my love for design more than anyone. And then there’s my mom…rather than spending time playing with dolls, she toted me around to every antique store imaginable and taught me the importance of mixing old with new and creating your own style rather than copying trends. My goal for my space is to represent me and to tell a story. The overall aesthetic is so many things mixed in one but with a great focus on keeping it clean and not cluttered. I don’t know if there is a word I can use to describe it other than welcoming. Truth be told, it’s a bit too trendy for me even now, but I know it works well for the architecture of the home. Do you have a interior design philosophy or motto you make decisions by? Ahh — love this question! The answer is…does it tell a story or represent me in some way. The rug in my kitchen — I hauled it back in my suitcase from India and every time I step on it I remember how hilarious it was pulling that thing all over India. The french bench in the living room was the first piece of furniture my mom ever purchased after college. I have a sea-glass bottle in my kitchen that I dug up on the beach in the Bahamas on my best friend’s bachelorette party. Obviously, not everyone can travel to meet artisans or their mom doesn’t save furniture or they probably wouldn’t be up at 6am running on the beach during their friend’s bachelorette weekend. But I have found that even intentional purchases can represent an individual. Also, I always stick to the rule that large pieces should be neutrals, and accent decor be your pops of color. What main needs influenced how you'e set up and prioritized the areas within your home. How is your space set up to function? So my house is around 1300-1400SF, but it’s a 3 bedroom 2 bath. Whoever designed this house did an INCREDIBLE job maximizing space with the layout, but the rooms aren’t as big as your typical newly built home. I always get caught up on the idea that if I have 30 people over I will never have enough room for everyone to sit. The reality is that there is no way I could have room for that much furniture and I have probably only once ever had that many people in my house at one time. Once I stopped obsessing over how I could make it work for what I thought it needed to be and focused on what it could be with the space that I do have, it made the process so much easier. I wish I could say I just throw everything together and it looks great, but I analyze every single detail. The best attribute of this house is the natural light so a lot of the rooms are designed around making sure the light can pour in as much as possible. Overall, it functions best for having a few friends over and making sure they feel at home. If I had 15 ft ceilings and a table that could hosts endless amounts of people, my aesthetic for a home would look drastically different…but I love my little casa just the way it is. There are so many different products in the world. Are you selective about what you allow into your space? If so, what criteria goes through your mind when selecting items? You can’t force a product to be meaningful. I have found that I purchase things that share someone else’s story and then let those items inspire me. I am selective in who makes the products I collect, the quality, and the design aesthetic. I’m probably not going to find a coffee pot that makes me feel any sort of emotion, but I can find one that I think is beautifully designed. Also, I am always in support of estate sales, antique shops and small businesses. Can you describe your Convivial items in 3 words? What drew you to collecting Convivial wares? My first two words are — 1. Beautiful and 2. Functional — I have a lot of plants and bowls. Like a lot, a lot. 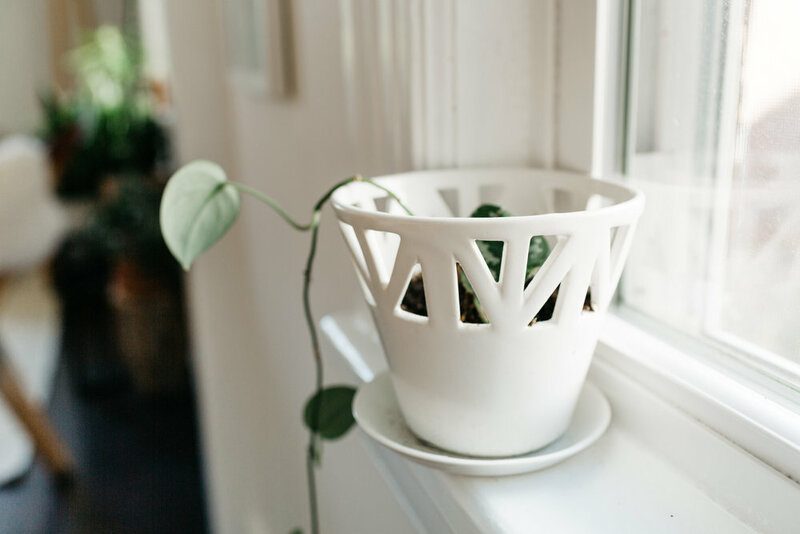 Convivial has the only planters that I know of that are large enough for decent size plants, absolutely aesthetically stunning, AND functional — ie: draining hole for water + designs that allow light to come across the entire top of the planter. It’s so important to have both of those when growing healthy plants. My third word is intentional. I love watching the Convivial instagram stories when talking about work and love for community. I learned about Convivial last year through Ryn Manby http://www.rynmanby.com - she had reached out to talk to me about my business and asked a few questions — and then sent the planter as a thank you gift for my time! It was so thoughtful! Obviously, I love plants and small businesses so I have been fascinated by watching Convivial grow — so while I didn’t find the planters or bowls on the side of the street in Tanzania, I know they are made with such love and intentionality - and the quality and designs are incredible!